-Intended stay has to be booked by a written document (e-mail) well in advance, which shall be confirmed subject to availability. -Confirmed stay email will be sent on receipt of complete payment. -All extra facilities and services utilized will have to be settled directly at the resort by cash. -The Checkout time is 11 am and Check in time is 2 pm; early check in or late checkout is subject to availability and on chargeable basis. -The rates indicated depending on the type of accommodation and occupancy available. -Rates vary for exclusive booking of Hut/Cottage/Executive Cottage/Executive Room i.e. for single occupancy, trips with private transfers and cruise, etc. -All guests must abide by the rules and regulations of the resort. -Indian National Guests: Need to carry Original Government approved Identity Card (Driving License/Aadhar Card/Passport/Voters ID card) of each and every residing guests, including children. The same has to be submitted at the time of check-in. Please note that pan card will NOT be accepted as a photo ID. Guests will not be allowed to check-in and the entire amount paid will be forfeited in case they are not able to produce a valid id. Their transfer cost back to Kolkata will be additional and will not be covered by the resort. -1 Night 2 Day (1 Breakfast + 2 Lunch +1 Evening Snacks + 1 Dinner). -2 Nights 3 Day (2 Breakfast + 3 Lunch + 2 Evening Snacks + 2 Dinners). Per day booked includes 1 Breakfast + 2 Lunch + 1 Evening Snacks + 1 Dinner. A fixed menu is served; guests may choose to order from the al-a-carte menu at an additional cost. Extra Adult will be charged as per extra adult rates. -Children of 6 years of age and above are considered as Adults. -Children 0-05 years are Complimentary without extra bed and fixed meals as per resort menu (sharing bed and seats during transfers and safari with parents). No snacks packed will be provided during bus journey for fixed deaprtures. -Extra Bed charges will apply (if requested for). -Rates do not include any extra food or beverage ordered not included in the package. -Rates do not include forest entry fees, park fees, entrance fees, porterage, tours/excursions and transfers not specified in the quote. - Rates do not include Cancellation, baggage and medical insurance; Staff gratuities; Any new Government Taxes, levies, fuel or industry increases which are beyond our control. -Rates do not include any activity not mentioned in the inclusions. 1. By booking/making reservation of the tour the guest agrees to comply with all the rules and regulations of the resort. 2. The entire tour in case of exclusive/any day departure at Sunderban Tiger Camp (STC) includes accommodation and meals at the Resort. Travel to and fro by Road, River Transport has to be booked separately at an additional cost. 3. 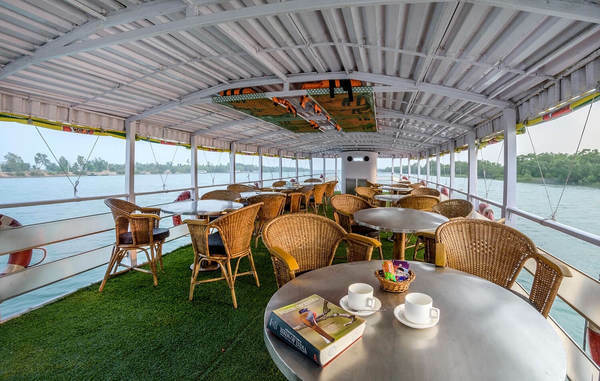 Incase of fixed departure the entire tour from Kolkata to Sunderban Tiger Camp (STC) and back to Kolkata includes fixed meals, travelling by road and river transport and the stay at the Resort. 4. In order to make the tour most enjoyable and for the safety and security of all concerned it is Mandatory for each and every Tourist/Guest to abide by the following Rules and Regulations. During the tour the tourist (s) are requested not to create any nuisance such as to disturb, irritate or annoy the other tourist (s) and will cooperate fully with the Sunderban Tiger Camp staff in order to maintain peace and harmony. 5. It is vital that the serenity of the Sunderban National Park is maintained. Hence, carrying any sort of music system is strictly prohibited. 6. Consumption of Alcohol drinks is allowed only at the specified areas. 7. It will be the sole responsibility of the tourist(s) to take care of their children during the entire tour. 8. In case of any accident and/or unseemly incident, Sunderban Tiger Camp or its staff members cannot be held responsible. 9. Neither the tourist(s) nor any other person shall have the right of action claim, whatsoever against Sunderban Tiger Camp or its staff members in respect of any injury whether fatal or otherwise. 10. Sunderban Tiger Camp or its staff members will not be responsible for any inconvenience or delay to the tourist (s) howsoever and whatsoever caused, or of any loss or damage to the tourist (s) and/his property, howsoever/whatsoever caused. 11. For the Safety and Security of the tourist (s) and the staff members, Sunderban Tiger Camp reserves the right and may be compelled to debar tourist (s) from any tour during its pendency. This clause shall also be applicable to those tourist (s) who fail to comply with any of the foregoing rules and regulations. 12. It is compulsory for all guests to produce a valid government approved identity card for checking in into Sunderban Tiger Camp, absence of identity card for any individual may result in barring them entry into the resort. In such case they will have to organize their transfer back to Kolkata at an additional cost, which will not be covered by the resort. Kindly see “Proof of Identity” for what documents are allowed. 13. In case of any unsolicited fault of the vehicle substitute vehicle arranged may not be qualitatively similar. 14. All disputes are subject to Kolkata jurisdiction.